Notes on the Epistemological Standpoint. The way of thinking suggested here can only be acceptable within a certain epistemological standpoint, which in this case is pragmatist philosophy, particularly that which is inspired by the writings of John Dewey, George Herbert Mead and Richard Rorty. Scholars with an epistemological standpoint of realism or critical realism would generally have quite a dismissive reaction to what follows. In pragmatist philosophy, as well as in other constructivist perspectives, theoretical models are not representative portrayals of what is real (Wood and Smith 2008). Whether theories are “true” or not does not rely on the grade of accuracy with which they display the real world, but on the question of whether they enable us to deal with the world in a productive way. This should not be misunderstood in a utilitarian way, wherein theories should legitimise what we want to do (see Barnes 2008). Dewey’s notion of truth relates all knowledge to experience. Knowledge derives from dealing with the world and attempts to enable man to handle the material and social world. Theoretical models are thus seen as tools that structure analyses. Relativistic notions of truth in this sense can be very productive in empirical studies. Theories give us new perspectives for understanding the world. They give us new ideas of how we can gain new approaches to our lived-in world. Theories can lead to experiences of significance, where intellectual ideas compound with practical and emotional experience in a way that fulfils the desire of explanation in a moment of aesthetic experience (Dewey 2005). Theories can never be comprehensive or ultimately justified. They are just a moment in the never-ending stream of thought. What I wish to present here is even less than a theory or a model. It is merely a heuristic concept, nothing more than an epistemic vehicle. In pragmatist thinking, it is said that explanations of the world should be evaluated according to what possible effects they might have on practical tasks. The benefit of this perspective is that it focuses on the dynamic of social topics, rather than on the stratification of social orders. Social topics appear to be fluid, in motion, flexible, and thus ever-changeable rather than fixed or structurally given. This article expands what has become known in social sciences as “thinking relationally”. Authors such as Allen, Massey and Sarre (see Allen, Massey and Sarre 1999, Massey 2006) have argued for geographers to think of their objects of consideration as being related to one another rather than as separate entities. A deep suspicion regarding categorical conceptions, which try to define things essentially, has also emerged. Such object-centred thinking neglects two central aspects : first, things in a materialistic sense become what they are not only by their own creative power but also through being shaped by a multitude of external influences ; second, things mainly become “what they are” through processes of cognition and thus through minds that compare, describe and define things. When we, as social scientists, think relationally, we conceptualise objects according to their interrelations, to the way in which these relationships are constituted and have developed over time. We thus mainly consider these relations in terms of bridging physical space, or alternatively, in terms of the extended time-space of Hägerstrand (see Giddens 1984). From Massey, we learn that it is absolutely impossible to sustain many grand theories, for example the modernisation theory, when we shift their focus from characterising developing countries to examining network links between western and southern countries over the last six hundred years (Massey 1995). It is no longer valid to assume that other countries could or even would like to pass through exactly the same stages of development as western countries when, for example, you consider the fact that western countries can only prosper by exploiting the global South. From post-structuralist thinkers, whether they work on the philosophy of language (Derrida 2009) or on cultural studies (Hall 1996), we also learn that categories are necessarily related to each other. Words do not denominate identities. “Blacks” are “blacks” only because they encounter “whites” in lived experience, and vice versa. If people of a different skin type did not exist, there would be no reason to term the skin type at all. But beyond that, such social categories (black, poor, immigrant, etc.) prevail in society and serve as a means of orientation. People apply such categories to other people, not necessarily recognising that these images transport prejudicing stereotypes. Such images are called social identities (Tajfel 1978) and they elementarily influence inter-group behaviour. At this point, thinking relationally again can help to see that such definitions always have a social reference to those who create them. In this sense, we can only see ourselves by regarding others. Social identities therefore evolve as a demarcation between the self and that which is not the self. Thinking relationally is thus very fruitful in helping to discover social injustices. In this article, I would like to take this relational argument further and suggest a way of thinking in dimensions. I argue that we should refurbish some old tools of spatial thinking, but in a relational manner. To explain this, I first refer to a number of other concepts of space. This review is of course not exhaustive, but I hope to cover the main strains of thought as to how the relation between space and social processes is conceived. Dimensions as an Essential Element of Space. On the Social Aspects of Space. I wish to state at the outset that it is not my intention here to replace any idea about social space. In the following paragraphs, I will identify the strengths of different approaches and show which insights each provides. The selection of ideas reviewed here is also not intended to give an overview of the present state of research, but to highlight different milestones in the development of social space theory in order to show different angles from which social space can be conceptualised. Furthermore, this selection of ideas is guided by what will be developed here, and I will justify my choices in situ. This review, naturally, cannot be all-encompassing. A very common way in which geographers attribute social aspects to spatial units can be found in nearly every course book about urban geography (e.g. Pacione 2006, Knox and Pinch 2010). Beyond textbooks and university courses, social area analysis has developed into a powerful tool for practical urban planning schemes. The way the spatial unit of the city is displayed in these works has become convention. The city map is cut into pieces representing districts according to what data are available. These districts are then outlined in different colours according to the degree in which a social parameter is present in this area. In this conception, we see a strict and unquestioned assignment of social parameters to physical units of physical space. There are some aspects of social area analysis that deserve critique. Firstly, can spatial units be the bearers of “the social”, or should the focus rather be on people or individuals, or, even more abstractly, on systems of signification which are the modes of communication ? Secondly, when spatial units are considered the containers of “the social”, is this not an essentialisation of space ? Will such essentialisations of space not always be political because they claim territorial assignments ? Moreover, there is also criticism that such conduct automatically subsumes everything under the respective logic of the inquiry. Finally, there are always huge difficulties in legitimising the boundaries that are drawn and frequent disregard for the heterogeneity within these bounded units. The quantitative statistical approach that social area analysis employs should also be mentioned. Through critical work, it is possible to discover the construction of such structuralist notions of urban space and the social consequences that derive from common scientific statistical and scientific methods. This is the main strength of Bourdieu’s work, which shows how social stratification and segregation has emerged. Clearly, Bourdieu’s work explores the constructionist character of existing societal orders. I will come back to his idea about social space later. At this point it is important to recall Bourdieu’s rigorous rendering of societal order determining space, as this rendering is typical for quantitative approaches. Relph (1976) and Tuan (1977) were early thinkers on the social aspects of space, who put individuals at the centre of their elaborations. They emphasised that space is a fundamental aspect of human experience, and they were especially interested in how people, who are situated in space, identify spatial units as places and use them as a source of identification. Even though these issues have not been neglected by subsequent authors, I would like to shortly explain Relph and Tuan’s ideas because they particularly emphasise the process of how spacial imaginations derive from experience. This is close to a pragmatist way of thinking, so often missing in newer constructivist approaches, which relates all knowledge to experiences with worldly objects. Lived experience is seen as a major factor in the definition of places. Relph refers to day-to-day practice and, with Schütz, he argues : “the place in which I am living has not significance as a geographical concept but as my home” (Schütz cited in Relph 1976, p. 6). In other words, the physical setting is less relevant than the imagination of a place and the meaning that is assigned to it. In Relph’s notion, space becomes place when people, by living in a place and socialising in it, attach meaning to their experience, and thus conceive a section of space as a unit. Much like Relph, Tuan’s notions of space is also, in some fashion, bound to the experience of physical space. He is also interested in place making considered as social conduct, which can only take place in a unit of physical space. I will further argue that the connection of the social with physical space in later theories has become either fully established as an inscription in the materiality of places, or increasingly marginalised because it has moved focus away from how spacial imaginations are rooted in individual and collective experiences. Today, a social constructivist idea of social space, of which Giddens (1984) might serve as example, is widespread. In his notion, “locales”, which are units of physical space, are arranged and constructed by human conduct for certain purposes. Physical space is thereby thought of as material setting, which needs at least an ontological distinction between matter and immaterial objects of consideration. Giddens develops his elaborations on the basis of Hägerstrand’s time-space model, which mainly facilitates quantitative approaches, but Giddens goes beyond this model’s positivistic character by emphasising the way time-space is designed and dealt with. “Locales” are thus understood as local settings that are equipped with material and social artefacts constituting meaning ; these settings can then be called “social space” (Giddens 1984, p. 89). This idea of social space is especially helpful for analysing how spatial settings determine, or are built to determine, social processes. For example, Nazi architecture was clearly built to represent and establish a social hierarchy. On a smaller scale, such hierarchical social relations can also be found in the postures of people when they talk in meetings or in a job interview, for instance. Spatial settings can be arranged with the intention to reinforce social status. This corresponds to Deleuze’s analysis of baroque architecture (Deleuze 1988). Accordingly, we can see a tendency to manifest physical space as a carrier of social meaning. There is definitely a clear link between the materiality of physical space and the social aspects that are attributed to that space. A series of writers, which I will discuss in the following section, go further and contest the idea that space can be absolute. It is difficult to summarise their arguments, but perhaps it can be said that they all argue that space must always be conceived as a matter of the perceiving mind. Massey and Soja in particular develop their ideas for the purposes of social criticism. It is thus difficult to extract the authors’ notions of social space from their societal or political standpoints because the relevance of their conceptualisations can only be assessed by regarding what conclusions they facilitate. Massey does not understand these stories as being totally unconnected, but sees interrelations between them. She calls these stories “trajectories”, emphasising that they evolve as a sequence of events. Interactions induce consequences, and reactions to these consequences again provoke interactions. Such a notion of space is especially helpful to emphasise that each place in the world has its own inherent history, which can only be understood in terms of its own internal logic. It is obvious that Massey’s notion of relational space rejects the idea of spatial distance. Space merely constitutes a distinction between the perceptions from different places to other places, from here to there, from inside to outside. Space in this sense is binary, or at least categorical, and has lost its dimensional spread ; the distance between has become irrelevant. According to Soja, space and place have become very important topics for social research and sociology (see Soja 1999). Soja develops his concept of “Thirdspace” with reference to Lefebvre’s trilogy of spaces (1991). Soja unfolds the dialectic between material space (“pratique spatiale”, in Lefebvre’s terms), which in Soja’s terms is “Firstspace”, and mental space (Lefebvre’s “représentation de l’espace”), which Soja calls “Secondspace” (see Lefebvre 1991, Soja 1999). These notions of space all have their distinct epistemologies. “Firstspace”, or “perceived space”, is the materialised space of traditional geography. Soja argues that in this perspective, sociality is not seen as something spatial itself, but rather as an outcome of patterns of distribution, regularities, and co-variation in the spatial unit at issue. “Secondspace”, or “conceived space”, mainly refers to the way spaces are imagined and negotiated, thus “in Secondspace the epistemological discourse about spaces receives the greatest attention” (Soja 1999, p. 266). With his idea of “Thirdspace”, or “lived space”, Soja diverges from Lefebvre’s notion of espaces de représentation. Lefebvre’s term is conceived to indicate that space is neither real nor imagined. Mental representations of the world can only derive from processes of interpretation and thus require an additional space, one that is a system of signification and symbolic meaning. Soja, however, emphasises practical aspects with his concept of Thirdspace (see Soja 1999). As Lefebvre imagines an abstract linguistic sphere of language, Soja searches for linguistic expressions. In his book Postmetropolis, he collects impressive examples from different textual sources, ranging from newspapers to poems, about social life in Los Angeles (Soja 2000). He shows how each of these pieces adds a layer of meaning to the established interpretations of the city. Through Soja’s work, we get an impression of the diversity of life in what he calls “lived space” (Thirdspace). Soja’s and Lefebvre’s notions of space are thus helpful for criticising established spatial imaginations and the way they are articulated. Space in Lefebvre’s and Soja’s conceptions becomes metaphorical. It is purely an association between the vastness of space and the ability of people to build manifold versions of practices and speaches. Space then becomes a sphere of opportunities, not of dimensions. So far, we have seen that what is called “social” was, at first, directly linked to units of physical space and then was later thought of more independently. In social area analysis (SAA), approaches to places, and social constructivist views, we find close inter-linkages between social processes and physical space, whether this is a city district (SAA), a place (Relph), or “locale” (Giddens). Bourdieu’s work also belongs to this category, but needs further attention in the next section. Other authors go further : Massey, Lefebvre and Soja mainly ascribe “the social” to an immaterial sphere of meaning. It can be concluded that all these conceptualisations successively untie the notion of what is social within space from a restricting material basis, and instead tend towards forming a rich collection of descriptions of how space is loaded with meaning, negotiated in meaning, and even produced by meaning. Furthermore, impressions of how language, or other systems of signification, can serve as a space open for expressions of actual life. We see that the focus has turned from physical aspects to more constructed and linguistic conceptions of the idea of what “the social” might be. This transition has parallels with what Michel Foucault (1966) has described as a general tendency for modern thinking. Hierarchies and Maps, Attributes and Attitudes. These re-conceptualisations of various ideas of social space show that the term “space” has successively lost its character of being stretched across dimensions. When we talk about the possibilities that language offers, or when we say that language opens space for verbal expressions, we have completely abandoned the idea of spread or distance. In this sense, “space” has become very metaphorical. In the following, I try to reactivate the dimensional character of space. The notion of space as a system of ordering, widely utilised in sociological research, seems, at first sight, to be close to what I would like to describe. Examples can be found in applied studies such as the Roper-Consumer-Styles (GFK 2007) or the Euro-Socio-Styles (GFK 2002) as well as in Bourdieu’s notion of social space as a space of lifestyles (Bourdieu 1998). In these cases, space, represented in the form of a Cartesian diagram, is used to separate issues and to allocate them a place. In his famous graphic, Bourdieu (1998, p. 5) constructs two axes for separating the lifestyles he found in his empirical study. The first axis displays the amount of capital a person possesses (here he combines different forms of capital, not only economic capital). The higher the amount of capital a person possesses, the higher they are rated on this axis. The second axis tracks the composition of total capital, whether it consists completely of cultural capital (left side) or of economic capital (right side). A mixture of these forms of capital is located on the axis according to the different degrees of the capital forms. Bourdieu then places lifestyles in this system of ordering. He locates, for example, teachers who tend to play chess in the upper left quadrant, and unskilled workers who tend to drink ordinary red wine accordingly lower. A spatial notion is thus used to systematically represent the social hierarchy as Bourdieu found it in his empirical studies. Conceiving that an unskilled worker will, even after gaining more capital, never become a private sector executive makes clear that the axes here do not describe a relation between categories. The figure is less an explanation of how categories are linked than a postulation that categories are unequivocally separated, and this is what Bourdieu often emphasises. At this point, I would like to argue that Bourdieu’s axes lack something that could properly qualify them as dimensions in a strict sense. If Bourdieu truly had conceptualised the axes as dimensions, the unskilled worker could move to the position of the private sector executive by gaining the required capital. But this is exactly what Bourdieu denies. He argues that it is the habitus, which a person has acquired through socialisation in his or her social environment that forbids such a transgression. People cannot easily change their social status. Bourdieu’s emphasis is put on describing how people are different due to their possession of assets. Those assets seem to determine the lifestyle of a person and beyond that someone’s position in the social hierarchy. However, the calculation of assets through assessing different forms of capital just compares lifestyles economically. Describing the social implications of a position requires to characterise the habitus of the respective lifestyle, which is the matter of another empirical observation. Imagine a city map that places all buildings that are constructed according to high standards at the top and those of low standard at the bottom. Such a diagram would just display a kind of hierarchy but would be useless for orientation because it does not show the way to these places. The logic of a map includes not only the idea of situating things but also that dimensions need to be designed according to the principles of movement between positions. If you look at a map, you can assume how further you must go or whether there are obstacles in your way. Transferred to the social space of Bourdieu, the former reflection means that on a quantitative basis of measurement, lifestyles can be arranged according to their possession of capital but then social space appears to be stratified. Bourdieu (1998) argues that people of different social status have no incentive to socialise with each other. Because people of different social standing grow up in distinct ways, they ultimately have attitudes, habits, and opinions, as well as a sense of aesthetics that are completely distinct from those held by individuals from different social backgrounds. According to Bourdieu, habitus constitutes social ordering because people who behave in fundamentally different ways will, in the long run, hardly be comfortable in each others’ presence. Furthermore, Bourdieu directly links social distance with physical distance. People who have different positions according to social dimensions also seem to necessarily be spatially separated. “In fact, the main idea is that to exist within a social space, is to differ, to be different” (Bourdieu 1998, p. 9). He concludes that social space obviously shapes physical space. Finally, society appears to be stratified, and this stratification can be unmasked as a historical and contingent development. Social change is thus not ruled out, but tendencies of change are not in Bourdieu’s focus. On a quantitative basis, Bourdieu’s thesis might be true on average, but what about those manifold social interactions that inescapably bring people of different social standing together where distinctions can be bridged ? Bourdieu’s concept of social space deals with attributes such as being an unskilled worker or a wine drinker. His version of social space is like a map of physical space that leaves out the roads. The roads and paths of social space appear in social encounters, in the way people become acquainted with each other, and when they accept or reject each other. Social life understood as interaction deals with attitudes that are situational and flexible. People may be reserved when they first meet, but can then become familiar with each other. Individuals may prefer wine on cold winter evenings while celebrating their wealth and status, but may also enjoy beer sitting together with old classmates, perhaps of other social standing. There are friendships and marriages between different social standings, and even social climbers. These cases indicate the flexibility of attitudes towards social identities. In contrast to statistical surveys about the attributes of individuals, which assume that these attributes are static, a perspective based on experience would assume that individuals never fully conform to fixed categories. Such a perspective would thus focus on examples whereby categories are bridged, switched, or rendered inconsequential even if these examples are not significant on a quantitative basis. An assessment of such examples would tend to give insight into the mobility and flexibility of society and the potential to bring about change. Bourdieu’s and Dewey’s works have basic aspects in common (Bourdieu and Wacquant 1996, p. 154) : they both reject action theory (individualism) and structuralism (objectivism), and focus on social practice where knowledge, beliefs, attitudes and acculturated behaviour patterns are permanently reproduced. Bourdieu identifies the emergence of different cultural imprints according to social stances as the result of practice, and focuses on the perpetuation of the existing social order. Looking backwards into the history of social construction, he realises the naturalisation of social conditions. Dewey, in turn, focuses on how experience as a cultural set of attitudes is challenged, individualised, altered, and creatively put forward into new solutions. He looks into the future (Nagl 2008), to the potential of individual solutions that might become new societal knowledge. Both perspectives thus have their strengths : one in discovering how social ordering has evolved, and the other in bringing the opposing tendencies into focus. The Ideas of Order, Distance and Transgression. In the following, I will outline a concept that considers “the social” to stretching out in dimensions or spanning dimensions analogous to the dimensions of physical space. This concept is to be understood as an epistemic vehicle, not as an ontological proposition of what social space essentially is. It can thus stand beside other ideas of social space, merely highlighting different aspects, just as different lenses offer different visions. As it is a critical concept, the term “physical space” must briefly be explained here. Since we learned from Einstein that space is curved, we can no longer regard Euclidean space in an essentialist or positivist way, but rather as contingent on our experience. By physical space, I mean the undeniable fact that we inter-subjectively do measure distances between objects that are located outside of our bodies. We mainly conceive space as extending in three orthogonal dimensions, two spanning a horizontal plane and one that stretches vertically. I do not want to conjure up a notion of Newtonian space as an infinite entity that pre-exists any physical process, or anything similar, particularly given that such notions are contested by newer developments in physics such as quantum theory or the theory of relativity. I refer to our everyday experience, which is still very much engaged with the idea of physical space. We experience physical space in our everyday practice of moving through the world. Even if distances are valued subjectively, we have learned that we can inter-subjectively measure them. We see this idea of space incorporated in all products of, for example, mechanical engineering. This should not be mixed up with the Kantian idea of space a priori. It is impossible to define what pre-exists our sensations, for example, whether touching matter is essentially different from other sensations. Physical space should thus not be conceptualised as a pre-existing experience ; it is a fundamental experience of the world allowing humans to deal with the influences of their senses in an adequate way. It is so tightly bound to our everyday practice of orientation that it is taken for granted and unquestioned. Euclidean space is a representation of this basic experience of physical space. Such a description of space is thus to be understood not only in terms of its metrical referentiality, which is just a special form of utilisation, but in terms of its broader contribution to interpretation and orientation. We handle physical distance with the notion of Euclidean space — the idea that dimensions expand orthogonally and that each point in space can be defined by coordinates on these dimensions. The fact that the three dimensions of physical space are orthogonal means that you can move in one dimension and in one direction without proceeding in the other dimensions. Without this elementary mathematical model of space, no maps could ever have been drawn and, in particular, it would not be possible to display the complex surface of the earth on a flat piece of paper and calculate distances. For these tasks, the development of three-dimensional Euclidean geometry was a pre-condition, thus Euclidean space is an elementary concept of classical geography. Euclidean space conceptualises dimensions as degrees of freedom. It is basic, in that there is an inherent logic that appoints the relation between different positions in space through the way the dimensions are conceptualised. This logic can be described as distance, which is an expression of what lies in between, and is also a statement about what needs to be done to move from one position to the other. For example, in physical space it supplies information about how far one place is apart from another (or how many metres need to be covered to get from one place to another). Thinking dimensionally means that the logic of dimension must be the focus of the analysis. This can be explained by regarding a simple collection of objects and statistical scales of measurement. On a shelf, you can collect apples and pears. In statistics, you would only bring these categories together if you wanted to make an assertion about the portion of each within the category of fruit. Then you would create a nominal scale. But still it is not a dimension, because there is no reasonable order for apples, pears, plums, etc. Dimensions thus begin with orthogonal scales because they make a relevant assertion about the differences between categories. As soon as you sort different fruits by size, the categories become hierarchically sortable. You focus on a certain attribute that is comparable amongst the categories but then you change the focus of the analysis from sort to size and you thus also change the perception of the objects. For instance, according to nominal scales, the apples remain apples (information probably interesting for stock management in a restaurant) ; the orthogonal scale changes the meaning of the category “apple” from a fruit with a certain taste to a fruit of a certain average size. Dimensions are more than statistical scales of measurement. They situate objects, establish the distance between objects, and furthermore include the idea of giving information about how to traverse distances. For example, if a geographical analysis maps a landscape by giving things positions according to the cardinal directions, the aim of such an analysis of the physical dimensions is normally to consider what such distances mean. From many maps, it is impossible to extract the exact distance in metres and centimetres. You will never be able to calculate the distance to your hotel from the information on a map you find on an advertising flyer of the hotel, but this information can still lead you there. The map represents physical space by displaying relevant objects in their relational order. Are there any obstacles or facilities along the way, such as a one-way street or metro line ? In the notion of Euclidean space, distance is metrically measurable, but on such tourist maps, distance should be conceived in a functional relation and orthogonal scale. Nonetheless, the hotel map also represents physical space in the basic sense of Euclidean space as it is founded in human cognition of space. I want to suggest here that many social topics can also be considered in terms of dimensions. It is not necessary that social dimensions, or the social spaces that we can conceive, are empirically measurable in the same way as physical space. Social spaces can even be conceived as entirely abstract ; it is only important that we look at the quality of the links between social categories with regard to social life understood as interaction. In the following, two examples will be presented. The first uses dimensional thinking in order to contest common approaches to consumer styles. It shows how quantitative methods can be used not to categorise individuals but to show their flexibility. The second example is part of a research project about stigma and discrimination. In this example, the analysis of social space is on a more abstract and interpretative level. Example 1 : Mapping Changing Attitudes. Figure 1 : Space of consumer behaviour. Source : Klaus Geiselhart/Benedikt Orlowski. Consumer style research normally aims to characterise consumers according to the way they consume. The idea is that consumers have attributes that allow us to differentiate them. Here an attribute is conceived as a feature of the individual consumer, which he or she constantly exhibits. Consumer style research misses the point that an attribute should be separated from an attitude, understood as a certain emotional relation towards something. In consumer style research, even attitudes such as buying impulsively are conceived as a stable attribute of a person. Different from attributes, attitudes are dependent on the actual situational setting and can thus change within an individual. One person might buy one item relatively impulsively, but the next item might not be purchased until the decision has been carefully considered. According to the assumption that people neither purchase things for one and the same reason, nor just in one mood, our study1 focused on attitudes of consumers that change from purchase to purchase. On a theoretical basis, two dimensions where consumers can be expected to switch their attitudes were developed (Figure 1). In the first dimension, here the x-axis, we expected the consumers to have different degrees of fun while making their purchases. Thus we called this dimension the axis of hedonism. It is based on a distinction that is very common in consumer research : the difference between “buying”, which is done to sustain one’s livelihood, and “shopping”, done as a leisure activity. Others have claimed that there is no clear distinction between the two forms (see Jansen-Verbeke 1990 and Carr 1990, quoted in Gerhard 1998). We chose to conceive this subject matter as a continuum, as a dimension wherein a consumer can hold almost every position. The degree of pleasure someone experiences while making a purchase does not necessarily depend on the product he or she purchases. You can purchase bread for immediate consumption because you are hungry and you will at least experience a little satisfaction by becoming satiated. But there are different bread products which, to various degrees, appeal to lifestyle aspects. In Germany, for example, we have “jogging bread”, which is whole grain bread with oat flakes on the top. 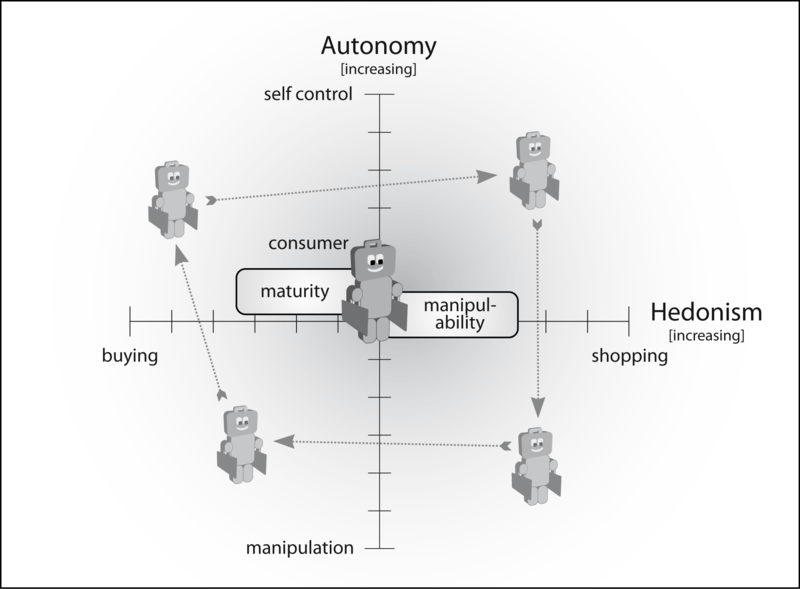 The y-axis displays the extent to which the buyer is aware of the way he is influenced, animated, or forced to purchase a certain item ; we have termed this axis the “axis of autonomy”. In the form of a stimulus-response behaviour, a consumer’s actions are fully manipulated. Perhaps the person has reacted to an exceptional offer, for example. In another situation, the same person might spare neither the trouble nor the expense to ensure a good buying decision. They can employ their rationality. They might think about how best to gain information about the product through different sources ; the Internet, literature, friends, experts, or sellers all might offer information about products. The buyer might also reflect the specific underlying intentions of the respective source of information. Furthermore, buyers can make themselves aware of the causes that underlie their own intention to buy something and could thus question even the assumption that a certain product is needed. Rationality is thus the means that individuals can employ in order to gain mobility on the y-axis. By thinking about the circumstances of the purchase, people gain self-governance. Next, the problem was to measure our dimensions empirically. We first designed a large set of questions, which we thought might represent our considerations. These were meant to assess people’s attitudes during different acts of purchasing according to our two dimensions. The questions were either designed as semantic differentials or as questions with nominal answers to choose from. In the latter case, each answer was given a certain value on the respective dimension it addressed. In the study, 37 individuals were equipped with a booklet containing 24 questionnaires. They were asked to fill out one questionnaire for each item they bought. In the end, we had recorded data from 429 purchases from 31 individuals. 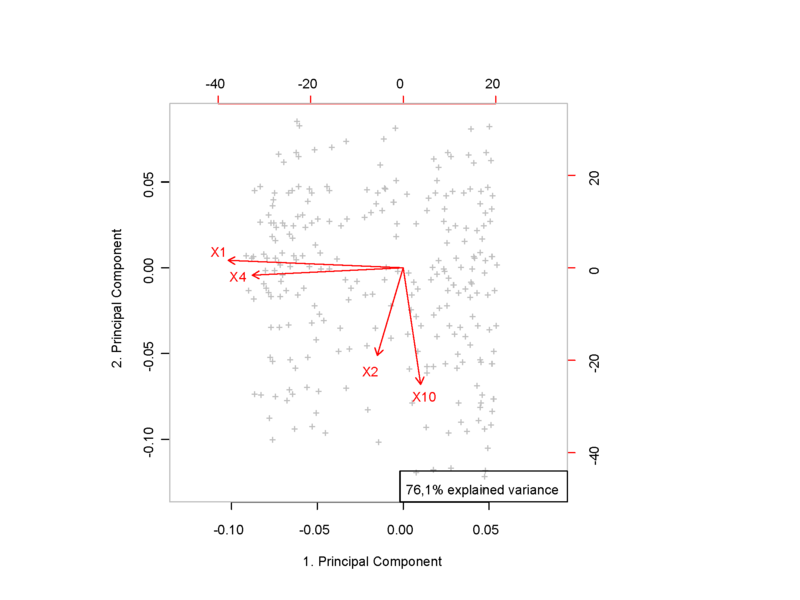 For the analysis, the data were processed with R.
Then we calculated a Principal Component Analysis (PCA). A PCA calculates whether a set of questions could be represented by fewer orthogonal variables only. In our theoretical considerations, we had designed two dimensions. We thus checked whether our data could be explained by two orthogonal variables. With a PCA there is the problem that one cannot know what the resulting variables calculated by the computer stand for if one does not have a basis for interpretation. We reduced the data to those variables that appeared almost orthogonal in the PCA, of which there were four. We then calculated a new PCA with only those variables and found that the two dimensions designed by the computer then explain 76.1 % of sample variance and that the four variables appear to be almost orthogonal (Figure 2). 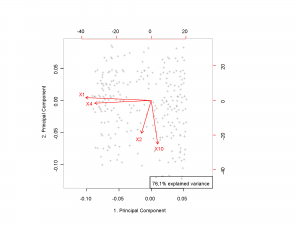 Figure 2 : Biplot PCA : The arrows show the shift of the variables from one purchase to another. Purchases are indicated as +. Source : Klaus Geiselhart. These four variables stem precisely from those questions that we initially thought best for assessing our dimensions. We thus came to the conclusion that we can regard the calculated dimensions of the PCA as our theoretically developed dimensions. This was a check to see whether we had in fact measured our intended dimensions and not something completely different. It now became possible to calculate a position for each purchase in the space of consumer behaviour and thus to map the paths of different buyers. One figure was processed for each participant of the study, and all figures showed that each person was quite mobile across the attitude dimensions (Figure 3). Figure 3 : The path of Person 1 through consumer behaviour space. Source : Klaus Geiselhart/Benedikt Orlowski. We determined that within our sample there was not one single person who always bought in only one manner, as consumer style research suggests. All the people moved through the consumer behaviour space. Figure 3 shows the path of Person 1 : the dots show the attitudes of Person 1 in moments of purchase (eight cases) and the size of each dot indicates the number of purchases at that position. The arrows represent the shift of attitudes from one purchase to the other ; elapsed time between these purchases was not regarded. For better clarity, I will explain the purchasing behaviour illustrated in Figure 4 : the individual began buying with relatively high enjoyment, whereas the next three purchases were done with much less pleasure, wherein two of these had a high degree of rationality. Then, with the last four purchases, the person came back to pleasure-oriented purchasing. For each person in the study, such a figure was processed, and further analyses were able to identify certain recurring patterns in the diagrams. It was also possible to find different attitudes according to the different shops where the items were purchased. The study is published on a website where users are given the opportunity to explore the data themselves (Geiselhart and Orlowski 2009, 2012). The Study in the Context of Consumer Research. Our example shows that instead of describing static consumer styles, consumers here display quite mobile behavioural attitudes rather than fixed attributes of character. Consumers are flexible in the ways they buy and thus should not be categorised into inflexible consumer styles. The study suggests that whether he or she buys impulsively or deliberately either for important needs or just for fun and leisure rather depends on the kind of product, the present situation, and the current mood of the person. In contrast to structuralist definitions of consumer styles, we establish the idea that consumers change the way they buy, and through further inquiries, this result might help to understand how these changes happen. Despite its reliance on a statistical method, this approach is not positivistic in the sense that it measures determinants of purchasing (Belk 2002). Our study outlines a way to contest structuralist research on consumer styles with quantitative data and thus functions as a bridge between entirely quantitative marketing research on the one hand and qualitative academic approaches on the other. In newer academic studies about consumption, qualitative methods tend to be employed in order to describe consumer behaviour in its full variability, relying on complex schemes of wants, constraints, and circumstances (Jackson and Thrift 2002). With its focus on mobility and the individuality of consumers, this study corresponds to current academic approaches to consumption. Example 2 : Social Distance. The second example that I want to introduce here is a study on stigma and discrimination that took place in 2009 (Geiselhart 2009). The way dimensional thinking is employed here is rather more abstract than in our first example. In the first example, dimensions are indeed derived from theoretical considerations and statistical analysis. In contrast, social dimensions, which are constructed in the second example, simply serve as an epistemic vehicle that should help to consider the issue systematically. An Introduction to Social Measuring and Distance. In our everyday lives, we permanently judge, estimate and measure things and people. When we do so, we make the world conceivable and appraisable. While judgements imply moral valuation, and estimations also refer to a somehow subjective standpoint, measuring evokes the impression of being value-free. Measuring is regarded as being objective and, in return, is often regarded as positivist. For example, statistical analyses are sometimes criticised for not representing their objects of study adequately but merely presenting them as such and using them as arguments in political processes. Measuring is however only a positivist task when we argue that the results of our measurements are the only realistic interpretation of the matter at hand. As long as we refrain from such a claim, we can see measurements in a more general way. Measurement is a form of contemplation about things or objects in order to very distinctly categorise and try to avoid prejudgement. The body, for example, can be measured with the body mass index (BMI), which is a ratio scale. However, the BMI is mainly important in therapeutic or medical use. It does not provide a very meaningful social category for everyday life. “People with a BMI above 40” is a category that almost nobody understands intuitively. More tangible and influential is the social category of being “fat” though ; this label comes with many prejudices and is a perfect example of what social identity is. When I begin a discussion of stigmatisation and discrimination with the term “measuring”, I want to emphasise that the attitudes towards people’s attributes can be separated from the stigmatising attribute itself. Of course, people mostly value other people intuitively, but this process is not determined but contingent. Attitudes towards people of other groups can change and this change is what the focus of this study was. The question here is how people, on an everyday basis, value or measure social attributes and how they feel about the resulting distances between themselves and others. How can such social distance be conceived ? Furthermore, our focus is on which societal aspects influence these attitudes of individuals or groups towards other members of society and which dynamics of integration and rejection take place. Thinking dimensionally should help to make these dynamic aspects systematically conceivable. Stigma in a Dimensional Perspective. Firstly, to serve the demands of the type of measurement explained above, stigma requires a new definition. Ideas about stigma that see it as a discrediting attribute depending on a norm (Goffman 1990, Falk 2001) are not adequate. If stigmatisation is considered dependent on a norm that is given in society on a structural basis, stigmatisation also appears as static and inflexible without any chance to be altered or diminished. The notion of stigmatisation presented here, by contrast, is less confined because it emphasises processes of interpretation. In psychology, the term “salience” is used for attributes that cause social categorisation. In our definition here, stigma is a salient attribute in this sense. The way an attribute induces social exclusion, self-segregation, or other forms of differential treatment primarily relies on processes of interpretation that the people involved in either do or not do, and whether they overcome their feelings of discomfort or not (Geiselhart 2009). Stigmatisation is, of course, a “social process” ; in this, I agree with many current thinkers about stigma (e.g. Link 2001, Weiss and Ramakrishna 2001, Parker and Aggleton 2002, Kusow 2004, Ogden and Nyblade 2006, Stuber and Schlesinger 2006, and others) but in addition, the notion presented here aims at opening a perspective onto the actual dynamics in social encounters and settings. Attributes of individuals are stigmas when they induce social distance, that is, when they make people feel that a particular social situation is uncomfortable or uneasy. Someone will thereafter feel a social distance between themselves and one or more of the people present. This feeling of discomfort derives from the recognition that someone is somewhat different from oneself (discrimination) or as the feeling that oneself differs from the other people present (stigmatisation). The more people assume that this difference has an influence on how they should behave, the more the situation becomes uncomfortable for the people involved. It is essential to always regard stigmatisation and discrimination as intertwined aspects of social processes. We always have to see two perspectives. The first is the perspective of those who bear a salient feature, who are affected by stigma. Stigmatisation can primarily be understood as the idea that someone knows that other people see something different, extraordinary in them. It goes along with the experience of being discriminated against and it is the felt necessity of coping with the specific stigma. Secondly, we have to consider the perspective of those who encounter someone who bears a stigma. Discrimination is primarily the act of making a distinction between “them” and oneself and treating “them” differently. Looking at how both are related, it is obvious that stigmatisation, as the way people who bear a stigma interpret and judge their attributes, fundamentally relies on the way others discriminate against them and their self-definitions. In turn, the way affected individuals behave due to stigmatisation can again strengthen existing prejudices. We can thus see stigmatisation and discrimination as two different perspectives deriving from people holding different social positions. Just how distance on the social dimension is felt depends on the interpretation and evaluation of the people involved. This is in analogy to physical distance, as has been discussed by behavioural geographers (Downs 1970). Whether someone thinks of travelling from one point to another is, in this way, less a matter of the metrically calculated distance in metres ; Briggs (1973) explains that travel decisions within a city are mainly dependent on city structure, how this structure was learned, and cognitive distance. Other individual factors might also play a role, such as a preference for a particular view on a certain route and so forth. Whether someone decides to travel or not might also depend on how important the visit is. How “far” a social distance appears to the people involved mainly depends on the prejudices and images about the people who bear the attribute at issue. Stigmatising attributes induce social identities as images about members of common social categories (Tajfel 1978). Such images extend beyond the attribute and the direct implication of the attribute, and also include complex descriptions of the abilities and the character of the people they designate. Whether a person believes in such images also depends on how much experience they have with people of that “specific kind” and how much effort they have already taken to individuate their impression of the person they actually encounter (Fiske and Neuberg 1989, Geiselhart 2009). The attitude someone has towards a stigmatised person is thus dependent on the prevailing social identities as well as individual experiences. The Social Dimension of HIV and AIDS. HIV and AIDS can be measured on different scales (Figure 5). A rational scale, for example, is the viral load in the blood or the CD4 cell count. These scales are measured and play a role in diagnostics. Also, the CD4 count is an important index for individuals living with HIV, because it provides information about the strength of their immune system. However, in everyday interactions between infected and non-infected people, these measures do not play an important role because they are not tangible. In my empirical fieldwork addressing HIV in Botswana (Geiselhart 2009), I found that the most influential scale of measurement was the binary distinction between being HIV-positive and being HIV-negative. In everyday life, the label “HIV positive” was found to be very influential on the way people behaved towards each other. This is not surprising, but if we see that the whole continuum of health conditions this illness is able to cause is just valued by two stages, it becomes clear that the label “HIV-positive” especially subsumes the fright of the illness and thus is a stigma par excellence. The label “HIV-positive” causes tremendous social distance even if the people affected do not show any signs of harm on their body or any impairment. The binary distinction causes severe social impairment, such as being fired from jobs, getting divorced or being excluded from families. People who do not recoil from socialising with people who are HIV-positive measure differently. The stage of being HIV-positive was further divided into less influential subcategories with an orthogonal ordering relying on the health status of someone living with HIV. These stages were : being HIV-positive without any sign of illness, on ARV treatment without symptoms, obvious symptoms of AIDS such as skin rashes, and treatment failure and full-blown AIDS, where people are obviously sick and become progressively bedridden. Within the self-help initiatives and amongst activists, another ordering exists. People who live with HIV can be divided according to the way they handle their status. They can be public, open, secretive, or highly secretive about their status. Being public about one’s status means that people speak at public events where they declare their status, tell their personal stories, and talk about their experiences with the illness. People who are open would not raise the subject of their HIV-positive status by themselves but, if asked, would admit to being HIV-positive. They talk about their status with friends, neighbours, and even with people less familiar to them if the topic is raised. They also assume that others know about their status. Being “secretive” means that affected people have disclosed their status to one or more members of their families, but outside the household keep their status secret. Those who are highly secretive even keep their status a secret from the circle of close relatives and the family. However, these people may have a confidant in a self-help group. 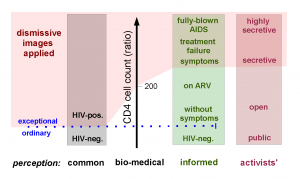 Figure 4 : Modes of measurement in the dimension of HIV/AIDS. In 2007, the threshold for inducing ARV treatment was 200 (2013 = 350). The red area indicates each mode of measurement for which individuals are considered excluded. The dotted line shows the demarcation line of a stigma, the division between what in a current situation is estimated to be ordinary or valuable, and what is exceptional or discredited according to a generalised employing common sense. Source : Klaus Geiselhart. 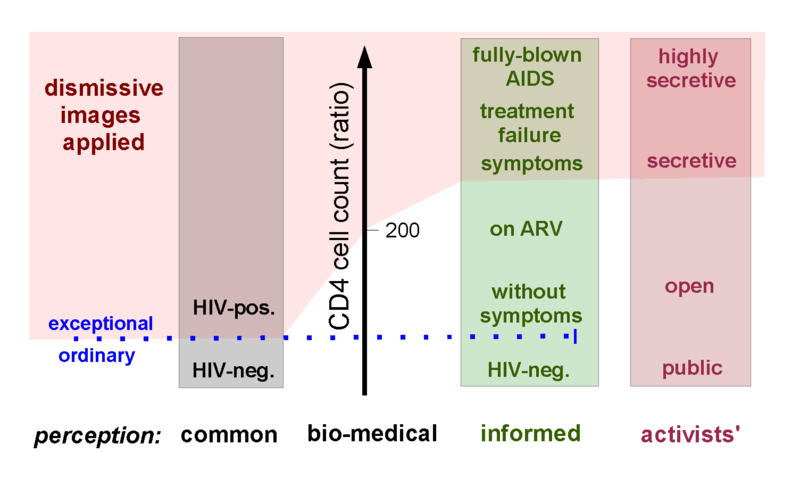 Figure 4 displays how the different modes of measurement of the dimension of HIV and AIDS shift the border where dismissive images start to be applied (red area). The images range from being healthy to terminally ill. The latter constitutes the extreme of discrimination. On the one hand, we find the full worthy member of society and on the other, the worthless individual which is bound to die and probably even is a burden. The figure shows how these different modes of measurement or scales value social distance differently. One extreme is the activists’ perception of the public speaker, who at least in theory has overcome stigmatisation and claims to be a full worthy member of society. The activists even erase the demarcation line between what is conceived to be ordinary (respectively valuable) and what is exceptional (respectively discrediting). By offering his expertise and experience with the illness to society with the intention to help and to raise awareness, the public speaker turns the stigma into a resource. It is especially the view of activists that opens the perspective towards flexibility and change of people’s attitudes. According to self-help initiatives, it is an essential element of coping with an HIV infection to find a way of integrating the stigma into life. Reducing stigmatisation means minimising the psychological load of the illness, which can be manifested as self-blame and self-segregation. Talking openly about one’s infection within the closer circle of friends is regarded as necessary so as not to always feel separated and rejected. On a societal basis, public speakers reduce discrimination and are seen as combatants against prejudices. Their vision is a society that is educated about HIV and AIDS and informed about the manifold possibilities of “living positively”2 with the virus. Such self-help initiatives thus work for an integrative society and see people’s attitudes as changeable. The Connection to Physical Space. We have seen that stigmatisation and discrimination take place in social encounters and social interaction. According to a relational notion of space (Massey 2006), social interaction can only happen in places. It is the actual setting, the physical and social situation, which influences the way people interact. We thus need to regard physical space and the way people interact to see any dynamic or change in people’s attitudes. To go deeper into this idea, we consider a three-dimensional space (Figure 6) with one dimension being time, the second being social dimension, and the third physical space. When physical space is reduced to just one dimension, buildings or rooms appear as flat, time-continuous layers. In Figure 5, the venue is displayed as such. Places can principally be considered as neutral regarding the social dimension as long as the physical setting does not exclude or privilege people with certain attributes through specific physical arrangements, or a certain social behaviour is explicitly or implicitly prescribed (an extreme example of this would be some physical settings under the apartheid regime). Rooms also might be built in a way in which certain attributes that a person bears become relevant, for example, when a ramp is missing, preventing a wheelchair from entering. Figure 5 : Spatial visualisations of social positions, distances, attitudes, and places. Person A and Person B obtaining different positions (1 and 2) on the social dimension. Source : Klaus Geiselhart. In Figure 5, Person A, by bearing a stigma, obtains a position “2” different from that of person B, whose position is “1”. We see through the time trace of both individuals that they do not really meet in the venue, although both are co-present in the physical space of the venue. The venue is conceived as not privileging any of the positions. The social distance could either be invisible and A and B interact as if there is nothing special, or the stigma is visible, or it is established. The individuals then evaluate the distance between their positions and may act in ways that are dismissive or integrative. Hence social distance starts to influence the interaction. For many stigmas, the affected individuals do not have the ability to easily alter their attributes and thereby reach another position on the social dimension. The desire of “social mobility” is a highly important psychological factor (Tajfel 1978, Turner 1978, Goffman 1990) and thus should be analysed for each stigma considered. A person with a deformation of a part of their body might have a cosmetic operation to correct what he feels to be a flaw. A person infected with HIV, however, might be absolutely immobile because they cannot get rid of the infection, but by secrecy would try to conceal the stigma. It is not possible to conceive people with different positions as getting closer on the social dimension when they meet and talk freely, even when they become friends. A bearer of a stigma, even if he or she socialises with a friend, remains immobile on this dimension. They might talk openly about it, they might forget the issue for a while, but their different social positions remain. But what they do is bridge the distance. By including the topic of the stigma into the conversation, they open up a space where experiences can be exchanged, where mutual understanding and integration can take place. We thus have to conceive the character of the relationship between, and attitudes of, the people involved when we conceive social distance. Figure 6 visualises different relationships. Person A has an open attitude and is capable of bridging the social distance. In contrast, Person C, with a rejective attitude, establishes a border between himself and Person A. It would further be possible to visualise other attitudes, for example, being hesitant, reserved, or shy. Figure 6 : Spatial visualisations of social positions, distances, attitudes, and places. Person A is open about the attribute at issue whereas Person C is rejective. Source : Klaus Geiselhart. With the help of the epistemic vehicle, other things can also be visualised. Different spaces can be displayed in their relation to the social dimension at issue. Is a given spatial unit neutral with regard to the attribute at issue (i.e. the venue in Figure 5) ? Do spaces exclude people that bear a certain attitude, or is a space reserved only for only those who bear a specific attribute ? Are these spaces time-continuous in the way they are related to the social dimension, or is a spatial unit only temporarily relevant to the people with a certain attribute ? It could also be possible to imagine a spatial unit which is temporarily opened in the social dimension, when, for example, an awareness campaign makes the social dimension a topic of public discussion within the spatial unit of the venue. This might, for example, be a public park where activists give speeches. The topic of the stigma is thus raised publicly. One could imagine the venue as becoming a bodily figure instead of being a flat layer as in Figure 5. The people who are present at the time become involved in the topic of the attribute as long as the awareness campaign lasts and as they themselves allow, according to their attitudes. In this case, the venue in the diagram must be imagined as expanding in the social dimension so that it at least embraces the paths of the individuals. HIV and AIDS in a Dimensional Perspective. With the idea of considering stigma as a dimension, it was necessary to identify social positions dependent on someone’s health and HIV status and common attitudes resulting from different scales of assessment. Furthermore, it was clear that the attribute of being HIV-positive determined the fact that the people affected have no ability to change their status. The impossibility of self-induced social mobility is one of the major aspects that limit strategies for coping with the stigma of being HIV-positive. Social mobility is only possible in the sense of social change by altering the attitudes of both sides — those who are affected and those who are not. In this case, individuals only have two opportunities for social mobility : they are confined to changing their private social relationships and, on a societal basis, to committing themselves to the fight for integration. This way of considering the topic also emphasises the fact that stigmatisation and discrimination are processes of assessing, evaluating, and interpreting HIV infections. This opens our perspective to the important role of active self-help initiatives. As the study focused on interaction, which always takes place in particular local settings, it was possible here to differentiate between local situations with regard to HIV- and AIDS-related stigmas and discrimination. In particular, significant differences between villages and urban neighbourhoods were found according to the degree HIV influenced those affected (see Geiselhart 2009, p. 249). Finally, with the help of this conceptual tool, it has been possible to analyse the local influence of events, people, and institutions with regard to their effects on stigmatisation and discrimination. It was possible to recognise which measures facilitate rejective or integrative behaviour and thus to make recommendations for stigma intervention (see Geiselhart 2009, p. 219). The mapping of these local situations helps us to describe geographies of inclusion and exclusion. The Benefit of Dimensional Thinking in Empirical Research. 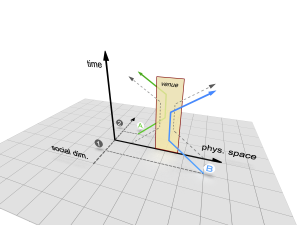 Many things could be visualised by means of 3D diagrams of social dimensions but the diagrams themselves are less important than the understanding of the dimensional character attitudes actually have. In contrast to this article’s first example — where diagrams showed individual paths —, the diagrams of the second example only need to be explained once in order to establish the idea of the spatial notion of social distances. The diagrams serve as a first explanation of the way we can conceive people as being related via social dimensions due to their positions and attitudes, and demonstrate how social issues can be considered spatially. Once this is clear, it is not necessary to repeat the diagrams. As said, the notion of stigmatisation should only be understood as an epistemic vehicle that is meaningful in terms of guiding an analysis of the topic at issue. It is helpful for deciding the statuses of different elements of consideration, and about the way they should be interrelated. It makes clear which status the different empirical observations have and how they need to be related to each other in order to form a consistent analysis. In the end, the diagrams do not appear in the analysis, but do establish a mode of thinking. In the following, I will explain which kind of systematics can be derived for dimensional thinking. Deleuze and Guattari (1987) argue that the world is often understood in a logic whereby categories and terms are constructed onto each other like a tree is grounded by its roots. They suggest the rhizome as an alternative way of understanding. The endless stream of social interaction could be understood as the rhizome between the nodes of social categorisations. Thinking dimensionally thus connects social positions back to the rhizome of actual everyday life. Dimensions : Which dimension can be considered ? Why does it make sense to consider this dimension ? Relation of dimensions : If more than one dimension is considered, how are these dimensions related to each other ? Are they orthogonal or not ? It is important to see whether a move on one dimension automatically results in a move on the other dimension. It is a basic principle of Euclidean space that dimensions are orthogonal ; it is thus possible to conceive the dimensions as degrees of freedom, where one dimension is independent of the others. Movement in space thus becomes more comprehensible. Considering social dimensions, it is equally important to clarify the relation between dimensions, to ask whether individuals can move independently on one dimension or whether such moves automatically imply moves in other dimensions. Positions and mobility : Which positions are possible on a particular dimension ? Are people mobile on a given dimension, i.e. can they change their positions ? What does it mean to be mobile or immobile on this or that dimension ? What hampers mobility ? What happens to a person when they move from one position to another ? Scales : Scales rule the way positions are defined on a dimension. In statistical use of dimensions, not every form of measurement is suitable ; only ordinal, interval and ratio forms are permitted. When social dimensions are considered in an interpretative way, it might happen that the scale of measurement is imprecise, that the scale might even change depending on which part of the dimension is regarded. It might often be the case that more than one scale is commonly applied to the object of study, thus one might find more than one interpretation of the topic. In such cases, it is necessary to compare the scales and find out which is used under what circumstances. Furthermore, it is interesting to see what kind of behaviour is induced by the different measurements and which scale is the most important with regard to people’s everyday behaviour. Distances : How large is the gap between positions ? Is metric difference, provided it can be measured, important for interpretations in everyday life ? How are distances perceived ? Is there any effort to bridge distances or not ? Are any borders established between positions ? With regard to social dimensions, it is thus necessary to assess the quality of a distance. Relation : What relations are possible between different positions ? Are people on different positions capable of designing or shaping their relationships, or are these relationships determined by external factors ? Perspectives and points of view : Which view does one have from a certain position ? What perspectives are possible ? How can positions be reassessed and reevaluated ? How can the entire space be reassessed with regard to the aspect of mobility ? Units in space : Are certain parts of the space demarcated, and if so, how ? An analysis of social topics that follows the principles mentioned above has a distinctly geographical character. Thinking in terms of Euclidean space is a genuine mode of geographical thought, so why not employ it for social topics if possible ? Often, sociological thinking employs methods of categorisation that emphasise what is stable or inflexible within society, or strives for a holistic perspective. The perspective described here puts the focus on mobility of individual viewpoints, as well as on simultaneity of perspectives. The example of HIV-related stigma in Botswana shows that this concept can be fruitful for assessing the situation of marginalised people, especially because it does not look only at established structural conditions but also at abilities of people to cope with them. Furthermore, the impact of social events, campaigns, or interventions and their effects on structural conditions come into focus. The perspective suggested thus opens analysis to possibilities of social chance. Thinking dimensionally is a slightly more geographical way of thinking relationally. It is not restricted to a difference-theoretical approach that always considers that identity is reflected in both the self and the other. In this linguistic concept, identity can only be narrated in reference to something different. Hence, the results of identity-building processes are not only linguistic distinctions, but are often manifested in the experiences of individuals which guide their attitudes as well. The conceptualisation of dimension thus transgresses linguistic categorisations and integrates them into something more general. With a focus on attitudes, we can take a look at what happens between the stages of linguistic measurement and concentrate on the continuity of a dimension, particularly where categorisation is imprecise. Homi Bhabha (1996), for example, explained how social practice creates new “in-between” cultures, even if his notion of space is very metaphorical. Employing a geographical imagination in the terms outlined in this paper, we can see that something is happening on a dimension between the defined poles or positions. We can see how linguistic differences are constructed through social practice, but we can also see the fault lines where definitions fail. Furthermore, we can raise the question of mobility, of how people move, try to move, or desire to move. Speaking with the terms of Deleuze and Guattari (1987), this could mean connecting systems of social categorisations to the rhizome of social life. I want to close with an appeal. Why not structure social topics in a genuinely geographical manner ? Why not employ a pattern of thought that every social scientist already possesses in order to analyse social topics — one which includes the ideas of order, distance and transgression ? We can use our genuine geographical thinking to help us understand the social world in a manner different from that of other social scientists. Thinking dimensionally is not the one and only way social scientists should think, but it can be a possible way to gain geographical imaginations. With the cultural turn in human geography, physical space has widely become dismantled. The aforementioned pragmatist conceptualisation of physical space shows that space can be conceived in a non-essentialist way, as a mode of perception through which very early development in childhood and later education in geography and maths becomes very deeply internalised by each and every individual. It allows inter-subjective agreements and is very effective in creating our lived-in world. The question is : why do we need to soften the idea of space when we realise that matter might not be as essential as we previously assumed ? Why not transfer this mode of perception into other realms that we used to regard as distinct from matter ? Maths does so and is quite effective in considering multidimensional spaces. If geographers have this powerful tool, why not employ dimensional thinking beyond its usual application to physical space and enhance our understanding of the dimensions of social interactions ? Illustration : « Sine Wave Shape », Philip Chapman-Bell, 18.05.2011, Flickr (licence Creative Commons). Allen John, Doreen Massey and Philip Sarre. 1999. « Afterword : Open geographies » in Massey, Doreen, John Allen and Philip Sarre (eds.). Human Geography Today, p. 323-328. Malden : Polity Press. Barnes, Trevor J. 2008. « American Pragmatism : Towards a Geographical Introduction » Geoforum, vol. 39, n° 4 : p. 1542-1554. Belk, Russell W.  2002. « Studies in the New Consumer Behaviour » in Miller, Daniel (ed.). Acknowledging Consumption. A Review of New Studies, p. 58-95. London : Routledge. Bhabha, Homi K. 1996. « Culture’s In-Between » in Hall, Stuart et Paul du Gay (eds.). Questions of Cultural Identity, p. 53-60. London : Sage. Bourdieu, Pierre and Loïc J. D. Wacquant. 1996. Reflexive Anthropologie. Translated by Hella Beister. Frankfurt am Main : Suhrkamp. Bourdieu, Pierre. 1998. « Social Space and Symbolic Space » in Bourdieu, Pierre (ed.). Practical Reason. On Theory of Action, p. 1-13. Cambridge : Polity Press. —. 1999. « Site Effects » in Bourdieu, Pierre (ed.). The Weight of the World, p. 123-129. Translated by Priscilla Parkhurst Ferguson. Stanford : Stanford University Press. Briggs, Ronald. 1973. « Urban Cognitive Distance » in Downs, Roger M. (ed.). Image and Environment. Cognitive Mapping and Spatial Behavior, p. 361-388. London : Arnold. Deleuze, Gilles and Félix Guattari. 1987. A Thousand Plateaus. Capitalism and schizophrenia. Minneapolis : University of Minnesota Press. Deleuze, Gilles. 1988. Le pli. Leibniz et le Baroque. Paris : Éditions de Minuit. Derrida, Jacques. 2009. Writing and Difference. London : Routledge. Dewey, John. 2005. Art as Experience. London : Penguin Books. Downs, Roger M. 1970. « Geographic Space Perception. Past Approaches and Future Prospects » Progress in Geography, vol. 2 : p. 65-108. Falk, Gerhard. 2001. Stigma : How We Treat Outsiders. New York : Amherst. Fiske, Susan T and Steven L Neuberg. 1989. « Category-based and Individuating Processes as a Function of Information and Motivation : Evidence From our Laboratory » in Bar-Tal, Daniel (ed.). Stereotyping and Prejudice. Changing Conceptions, p. 83-103. Berlin : Springer-Verlag. Fraassen, van Bas C. 1980. The scientific image. Oxford/New York : Oxford University Press/Clarendon Press. Geiselhart, Klaus. 2009. « Stigma and Discrimination : Social Encounters, Identity and Space. A concept derived from HIV and AIDS related research in the high prevalence country Botswana. » PhD dissertation, University Erlangen-Nuremberg. Gerhard, Ulrike. 1998. Erlebnis-Shopping oder Versorgungseinkauf ? Eine Untersuchung über den Zusammenhang von Freizeit und Einzelhandel am Beispiel der Stadt Edmonton. Canada : Marburg/Lahn. Gesellschaft für Konsumforschung (GfK). 2002. « Euro-Socio-Styles ». —. 2007. « Zwischen Abenteurern und Realisten » in GfK inside, vol. 4 : p. 28-31. Giddens, Anthony. 1984. The Constitution of Society. Cambridge : Polity Press. Goffman, Erving. 1990. Stigma. Notes on the Management of Spoiled Identity. London : Penguin Books. Hall, Stuard G P (ed.). 1996. Questions of Cultural Identity. London : Sage. Jackson, Peter and Nigel Thrift. 2002. « Geographies of Consumption » in Miller, Daniel (ed.). Acknowledging Consumption. A Review of New Studies, p. 204-237. London : Routledge. Knox, Paul L. and Steven Pinch. 2010. Urban Social Geography. An Introduction. New York : Pearson. Kusow, Abdi M. 2004. « Contesting Stigma : On Goffman’s Assumptions of Normative Order » Symbolic Interaction, vol. 2, n° 2 : p. 179-197. Lefebvre, Henri. 1991. The Production of Space. Oxford : Cambridge. Link, Bruce G. 2006. « Stigma and its public health implications. » The Lancet, vol. 367, n° 9509 : p. 528-529. Massey, Doreen. 1995. « The Conceptualization of Place » in Massey, Doreen and Pat Jess (eds.). A Place in the World ? Places, Cultures and Globalisation, p. 45-77. Oxford : Oxford University Press. —. 1999. « Spaces of Politics » in Massey, Doreen, John Allen and Philip Sarre (eds.). Human Geography Today, p. 279-294. Malden : Polity Press. —. 2006. For Space. London : Sage. Nagl, Ludwig. 2008. « Pragmatistische Handlungshorizonte. Erwägungen zur Tiefenstruktur des Zukunftsbegriffs bei Rorty, James, Peirce und Royce » in Hetzel, Andreas et al. (eds.). Pragmatismus. Philosophie der Zukunft ?, p. 189-216. Weilerswist : Velbrück Wissenschaft. Ogden, Jessica and Nyblade Laura. 2006. « Common at its Core: HIV-related Stigma. Across Contexts. » Report for the International Center for Research on Women (ICRW). Pacione, Michael. 2006. Urban Geography. A Global Perspective. London : Routledge. Parker, Richard and Peter Aggleton. 2002. « HIV/AIDS-related Stigma and Discrimination : A Conceptual Framework and an Agenda for Action. » Report for the Horizons Program of the Population Council. Relph, Edward. 1976. Place and Placelessness. London : Pion Limited. Soja, Edward. 1999. « Thirdspace : Expanding the Scope of the Geographical Imagination » in Massey, Doreen, John Allen and Philip Sarre (eds.). Human Geography Today, p. 295-322. Malden : Polity Press. Stuber, Jennifer and Mark Schlesinger. 2006. « Sources of Stigma for Means-tested Government Programs » Social Science & Medicine, vol. 63 : p. 933-945. Tajfel, Henri. 1978. « Social Categorization, Social Identity and Social Comparison » in Tajfel, Henri (ed.). Differentiation Between Social Groups. Studies in the Social Psychology of Intergroup Relations, p. 61-76. London : Academic Press. Tuan, Yi-Fu. 1977. Space and Place. The Perspective of Experience. London : Arnold. Turner, John C. 1978. « Social Categorization and Social Discrimination » in Tajfel, Henri (ed.). Differentiation Between Social Groups. Studies in the Social Psychology of Intergroup Relations, p. 101-140. London : Academic Press. Weiss, Mitchell G. and Jayashree Ramakrishna. 2006. « Stigma interventions and research for international health » The Lancet, vol. 367, n° 9509 : p. 536-538. Wood, Nichola and Susan J. Smith. 2008. « Pragmatism and Geography » Geoforum, vol. 39, n° 4 : p. 1527-1529. 1 The study was conducted with the help of a group of students in the context of a project seminar that the author gave at the University of Erlangen-Nuremberg. 2 “Living positively” is a concept of the self-help movement meaning to live with a positive attitude toward life despite the HI-virus. This article carries the constructivist idea to its logical conclusion. 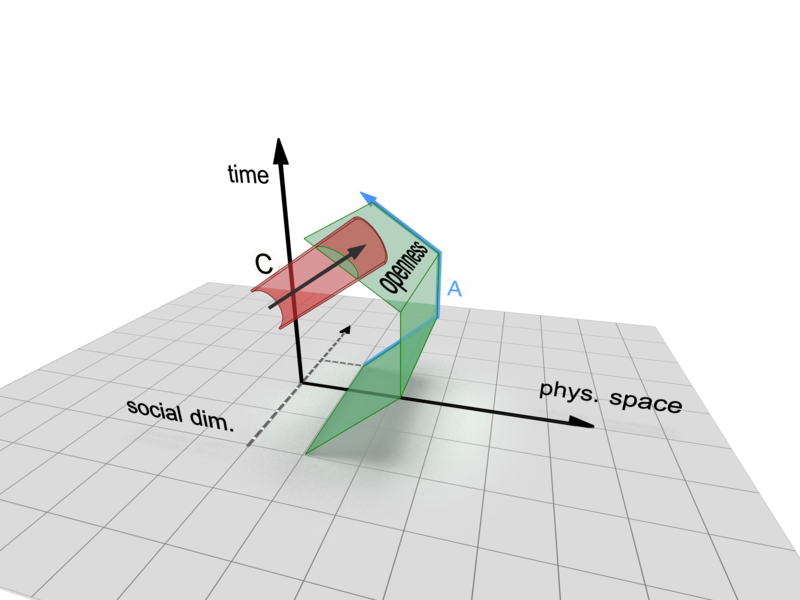 If space is always perceived in three dimensions and does not have a substance, why not consider social topics in the the same way and see whether this produces informative and new insights ? The notion of Euclidean space as a dimensional system of ordering is an elementary concept in social sciences. This article gives two examples of how this concept could be employed in a non-positivistic and non-essentialist way with regard to social topics. Euclidean space is thereby not only seen as the metric space of mathematics but is also founded in the human cognition of space. The strength of this concept is that it reflects a basic experience and is thus very tangible and comprehensible. It is largely internalised by every individual and can thus evoke conclusive explanations when deliberately used. The first empirical example assesses day-to-day practices of consumption and is a critique of consumer style research. The second is an example about HIV-related stigma and discrimination ; it explains how the suggested perspective can be helpful in analysing social segregation and categorisation of marginalised people. The article introduces dimensional thinking as one way to capture geographical imaginations. Looking at attitudes of individuals rather than their attributes opens a perspective to mobility and flexibility in social space.